Designs inspired by George MacDonald's Princess and the Goblin (1872). This book has some of the most evocative creature descriptions I've ever read, when describing the animals that the goblins of the story keep. Truly crazy stuff. The idea is that the goblins themselves were once human beings who, due to some disagreement with their human king of long ago, began living underground, and then began to devolve over many generations. 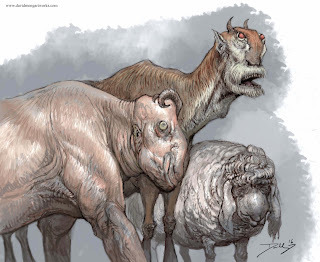 The livestock and occasional wild animal they brought with them to live below also began to physically unravel through the unnatural underground conditions, and mix among themselves (not to mention the goblins), to the point where one could not tell what original creature each being descended from, and that their shapes were more akin to outlandishly grotesque, living versions of children's drawings than to anything the natural world could produce. Incidentally, the book is available to read free online, and the chapter concerning these monstrosities is called "The Cob's Creatures". Interesting to note is that, while the Princess and the Goblin is meant as a religious allegory (I believe it actually predates the Narnia books), MacDonald introduced some rudimentary notions of natural selection/evolution as the concept behind his insane goblin beasts.